Cutting up your own socks...way to own the libs, guys. 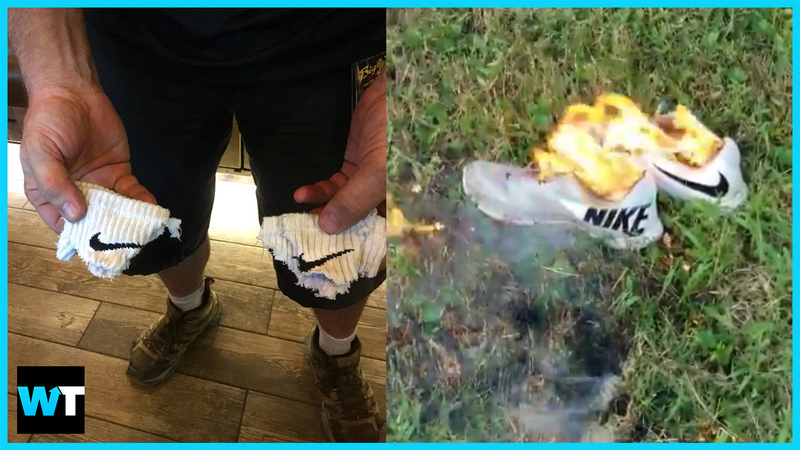 Colin Kaepernick is featured in Nike’s “Just Do It” 30th Anniversary ad and it’s inspired some confused apparel-owners to burn their clothes. The ubiquitous “Just Do It” slogan first appeared in this Nike commercial in 1988, and it’s been a staple of American marketing ever since. And for the 30th anniversary of the slogan, Nike is making a statement. The sacrifice, of course, is that despite being a very good quarterback who started in the Super Bowl, he’s been unable to find a job in the NFL for two years, and there’s good evidence to suggest that it’s because of his protests against racial inequality and police brutality. He even has pending litigation against the NFL for conspiring to keep him out of the league. But there are people out there who, gosh darnit, just don’t like the ad campaign, and are willing to own themselves in astounding ways to show it. Bahahaha! Only in America can you film yourself destroying something that you just spent $300 and claim you’re sticking it to the man. Late-stage capitalism at its finest. Wearing torn up socks to own the libs…. This dude cut the Nike swoosh off of his shorts, but couldn’t he have changed out of them first? Really awkward. Several people online went so far as to burn their Nike apparel in protest. It’s interesting that people are now choosing to protest shoes made by people overseas who don’t get paid a living wage and are routinely abused… .because they think somehow Colin Kaepernick is an affront to decent values. The fact that anyone, especially someone who is paid to talk on television such as Tucker Carlson, can act as if Colin Kaepernick, and those who continue to kneel in the NFL, haven’t been very specific about what they’re protesting – it’s just ignorant. Period. That’s what it has always been about. It’s about Trayvon Martin, Freddie Gray, Philando Castile, Sandra Bland, and a list that goes on and on precisely because of the issue that Kaepernick raised. Is that specific enough for you, Tucker? It’s also important to know that Kaepernick, initially, didn’t want any of this attention. He first sat for the anthem during preseason games in 2016, and nobody even noticed until the third time he did it. And it’s only persisted as a “controversy” since President DVR has kept tweeting about it. Basically, at this point, if you’re against Kaepernick and other players protesting racial injustice, you’re admitting that the symbols of the flag and the anthem are more important to you than what those symbols stand for – equality, justice, and freedom. At any rate, the shoe-burners hope that their protests will put a dent into Nike’s bottom line. Which is unlikely to happen. Nike spends millions on market research, and they know who their audience is and more importantly, who it will be for a generation. Nike’s actually had Kaepernick on their endorsement roster since 2011, and hadn’t used him since 2016. Making a new deal to feature him in an ad now is a really big deal. So, look, Nike’s definitely using a social justice issue to make a buck, no doubt. But, to have a major brand come out in support of Kaepernick and thus his issue is a really big deal. It tells the world: Hey, not only do we believe in what you’re saying, but we believe in the power of black dollars and those of their allies to support us more than the dollars of those with regressive values. But…What do you guys think? If you’re angry at me, let me know. Don’t burn your stuff. Donate it to Goodwill or something. And tell us what you think at @WhatsTrending. VIDEO: Here’s What You Need To Know About The JEFFREE STAR FEUDS!